The Bas-Rhin is situated at the very heart of Europe. Its culture and architecture are a blend of the two great powers that regularly jostled for the territory throughout its long and intriguing history. With warring out of the way, the department is now home to some of the most important European institutions. 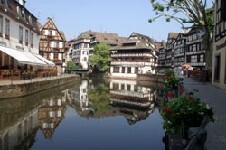 The cosmopolitan city of Strasbourg, meaning 'city of the roads', has a lot to offer visitors of all ages. Strasbourg is home to over 420,000 people and constantly receives large numbers of visitors owing to the fact that the European Parliament, the European Court of Human Rights and the Council of Europe are all based here. Strasbourg's picturesque and largely pedestrianised medieval centre is located on an island in the River Ill and is now a UNESCO World Heritage Site. Visitors should not be deterred from visiting the town by the misguided belief that it is totally dominated by the European institutions it plays host to. The Gothic Cathedral of Notre-Dame, constructed from pink sandstone is rich in architectural and artistic features, from its hideous gargoyles to its breath-taking rose window. Nearby you'll also find the Palais Rohan where the Musée des arts decoratifs is located. Following the River Ill south you'll find the pretty and intellectually renowned town of Selestat. The Bibliothàque Humaniste, one of France's historical gems, can be found here. This extensive ancient library counts a number of priceless books as part of its collection including 'Cosmographiae Introductio', written in nearby St-Die, which was the first book to use the word 'America' instead of 'the New World'. The peaceful atmosphere that pervades the town of Saverne today is somewhat at odds with its turbulent history. In the 16th century, the town was the scene of a revolt by 20,000 of the region's peasants. The Duke of Lorraine and his troops managed to stamp out the revolt and promised to spare the peasants if they surrendered themselves. Although the peasants did so, they were all killed regardless. Saverne is a certainly a place for boat lovers. In front of the towering Chateau there is a marina that can hold 70 boats at any one time. 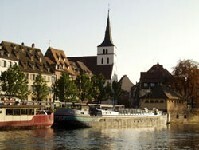 The Marne-Rhine canal also runs through the attractive city centre. The town of Wissembourg lies on the French/German border in the north of the department. The skyline is dominated by a number of charming spires and towers. The church of St-Pierre et St-Paul has two enormous towers, which offer superb views over the surrounding countryside. Basel/Mulhouse airport in Haut-Rhin currently offers direct flights to/from the UK. You could take the Channel Tunnel and then change in Paris for a TGV train that will take you to Strasbourg. If you'd rather take the car though, the nearest ferry ports are Dunkirk, Calais and Dieppe. Finding accommodation in Strasbourg while Europe's policy makers are in town is extremely difficult and so any rental property here is likely to be in high demand. Bear in mind, however, that the property prices are considerably higher here than in much of the rest of France precisely because of its European connections. Do you know Bas-Rhin better than we do? Do you have photos of Bas-Rhin? The Bas-Rhin is located in the north of the Alsace region of eastern France.